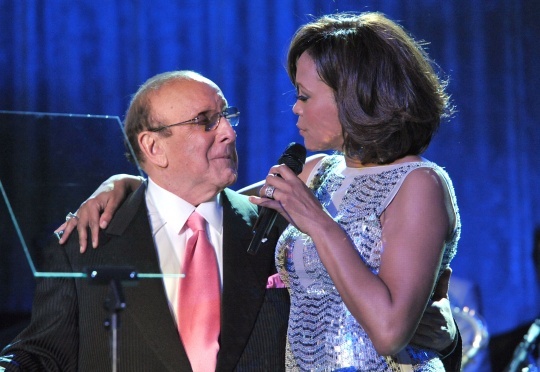 KayKiSpeaks.com: Clive Davis Says Whitney Houston is a no go?? Theyve been together for forever & when the rest of the world had given up on Whitney, Mr. Davis was right there with all of the hope in the world that "the voice" still had it. Welp, after a few hard couple of years full of bad performances, cancelled shows, and health issues, it seems as though Mr. Davis may be looking at things from a different perspective. He was on LA radio 103.5 yesterday and the conversation arose about Whitney.. continue reading for his response. I actually agree with him to some extent. Do I think its necessary to share this information with the world & therefore Whitney? No. Why, because Im sure Whitney knows her voice isnt what it used to be, and Im sure she's heartbroken by it, and Im sure Clive knows, it never will be what it was. I do believe she needs to put those cigs down though.. asaply!